i'm slightly surprised how little BT4 talk the internet has. Re: i'm slightly surprised how little BT4 talk the internet has. Not turn based in the same manner of BT when it comes to combat. Whatever label you want to give it, the combat isn't like BT. When you can't sit and think and strategize before being attacked, when your hand is forced on a time constraint, it's not 'turn based'. Grimrock is not turn-based, so not exactly the same experience as BT. Close, perhaps, and the grid exploration with fre look is nice, but it's not a turn-based blobber. Frankly, I still come back to the point about seeing literal creatures in the dungeons as elements implying the game's non-turn-based nature. It forces a live view of the party's existence, rather than a virtual/imagined one ala BT1-3. So we either have this awkward creature-standing-still-waiting-spaces-ahead-to-be-touched, or the creature advances and attacks in realtime and real space. In BT1-3 there was never that visual limbo. Our brains filled in the gaps. If we enter a 3x3 grid room with a creature in the center square, without seeing it we concoct in our mind the 'story' of what the party is doing in the environment and how. If we see the creature in the square, suddently it's weird - why is it just sitting there, not attacking (even though we know it's turn-based)? The literal contrasts the abstract. Anyway... that's been my concern with having visual wandering monsters as per the graphic demo. 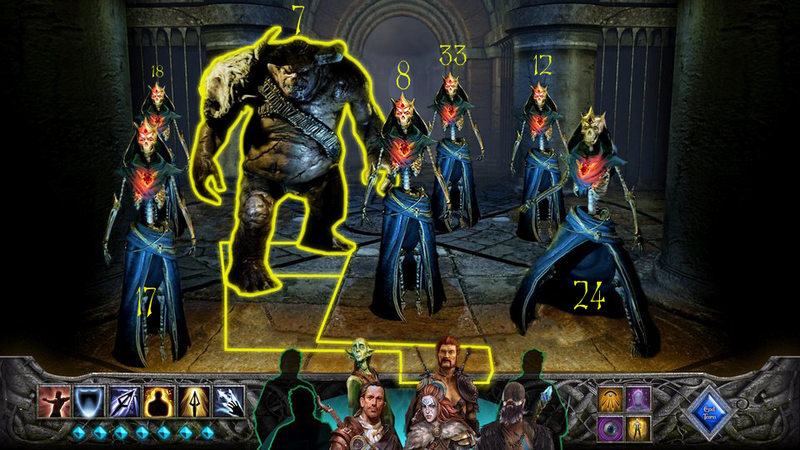 I wouldn't mind if, like grid toggling, we could toggle visual wandering monsters off for a more 'classic' experience. based on the video of their combat, it looks like they've already worked around that by having the creatures be on a patrol route with vision cones which seems like a pretty nice mix of turn-based benefits and better immersion of a living world. if you are entering a 3 by 3 occupied room, a creature doesn't need to be awkwardly standing there - it can be patrolling around the room or talking to another. They modeled the word in 3D. So long as each enemy has a walking, talking animation, they can script each encounter like that - though this probably means smaller game overall if each potential encounter includes the workload of designing how it behaves while waiting. Yes but again the vision cone is a 'live' environment mechanic. You're now actively tiptoeing around a changing circumstance. That "live" element is what was essentially missing from the classics. Apart from day/night, and some stat restoration mechanics, and snares in BT2, the core gameplay elements were all turn(or phase)-based; passive. By adding in-world live action, it's a step towards, as you say, a "living world" - what I tend to refer to more as the literal than the abstract. The classics weren't a living/active world in that sense. There was a minimized visual reference for locations and passive world content (magic mouths, eg) restricted to the view portal, and everything else was abstracted. Creatures, characters, items, special stuff - all using referencial placeholders (artwork and slides, text descriptors, etc). So, it's not that we're expecting that minimal level of visual development for BT4, but there are some gameplay elements that when making use of 'live action' conceptually, draw you out of the abstracted world and into a temporally restrictive and interactive one, a more literal and time-constrained engagement with the world and everything in it. That's more like where Grimrock went, and that's what we're getting with wandering monsters and vision cones. I still think the best example of that is that what we see of BT4 currently won't allow for the 4x99 berserker style encounter from the classics. It's not possible - because we're shown that creatures exist visually and literally in the "living world" environment of BT4. So the visual design mechanic is inherently limiting the gameplay mechanic from the classics. Honestly, I would have no problem with the exploration and passive aspects of the (gorgeous!) visual world graphics existing as they're currently being developed, and being able to turn off in-environment creatures, so that they 'appear' just like the classics as we enter squares - EVEN if that meant we could have 498 berserkers in a cramped 3x3 room. -> Removing the visually literal and active (which BT1-3 didn't have) opens the door for more flexibility in the abstract. Except, while it would be more faithful to the originals, having that literal/active design would be more appealing to or successful in the current gaming marketplace. And that's something that worries me. from the gameplay video, that kind of encounter seems quite possible to implement in BT4 especially once we take into account the developer commentary where they go into details of that combat. Specifically, in the fight, they engage in the 'living world' a single creature patrol - but that single creature was an abstract representation of a group of 3. 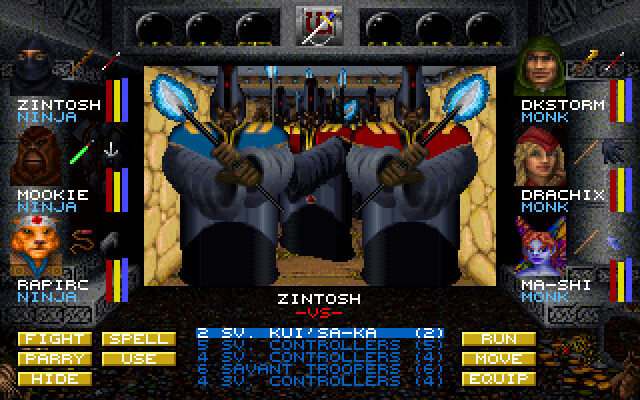 Than in middle of combat, they had an intrusion by a 4th enemy - one which in this case turned out to be hostile to both player and initial enemy. That seemed scripted but still, given that they have those engine capabilities already, I see no barriers to a combat encounter where for plausibility reasons your party is engaged in a narrow corridor where you start fighting 8 berserkers and every time you kill one, another takes his place until you murder you way through 491-strong reinforcing throng. Whether that's going to be a fun encounter is of course another matter, but my point is that given their engine allows reinforcement mid battle, and abstracting multi-creature parties with single creatures in the living world, they are not technically limited from simulating any larger numbers encounters . 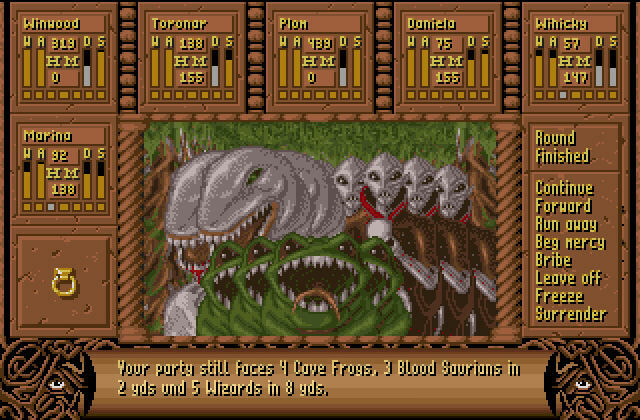 EDIT: on a related note - I haven't played the old Bard's Tale, and don't know how Area Effect / Group Target abilities worked in those games or even if such existed, but basing my opinions on how Wizardry 7 combat played out, where you had 7 abstract rows, each holding up to 99 enemies and spells that were either 'single target' vs 'row target' vs 'all rows target' - and how that played out vs. Wizardry 8 where you had your enemies positioned each independently in a 2D plane around your party and your AE spells had to be aimed within that physical plane, hitting only the targets within the aimed area. So based on that Wiz7 encounter vs 7x99 of weak enemies was incosequentual as one weak 'kill all' spell would kill them for same cost as 7x10 group. But once you are physically limited to how many you can engage at a time, in BT4 that seems to be 8 - now a larger group becomes a potential tax on your resources even if each individual enemy is weak. That allows for more design space when it comes to encounters. Yes but again the vision cone is a 'live' environment mechanic. You're now actively tiptoeing around a changing circumstance. That "live" element is what was essentially missing from the classics. Apart from day/night, and some stat restoration mechanics, and snares in BT2, the core gameplay elements were all turn(or phase)-based; passive. Exploration in Grimrock could be the same as in BT for just disabling each of the monster's model and sound components—until combat; they would still be there, but the player would not see or hear them until their party was attacked. That wouldn't change the nature of the game from realtime to turn based. ...which is what I said above. And that's why I was describing the mechanics, trying to stay away from labels. BT is almost entirely passive, save for the few mechanics mentioned. The live interaction primarily pops out with NPC and enemy encounters. Grimrock's encounters are extremely live and literal with graphic in-world representation of the creatures and non-passive activity. BT's encounters are entirely abstracted and passive (turn/phase/whatever based). NewlyObsessedFan wrote: Specifically, in the fight, they engage in the 'living world' a single creature patrol - but that single creature was an abstract representation of a group of 3. Than in middle of combat, they had an intrusion by a 4th enemy - one which in this case turned out to be hostile to both player and initial enemy. Ok thinking over your comment... what happened was, there was one creature that was spotted, which began the combat intro - that then lead to 3 more creatures 'reinforcing' the first. I'm guessing you meant that one creature 'represented' the 4 of them, since the intended combat was for 4, not just the one wandering. However the additional creature at the end was described as a 'special event', not a typical combat event. Even so, yes the graphic and game mechanic does allow for more flexible encounters than merely facing off what you meet immediately wandering the dungeon. That itself is good... from a gameplay standpoint, if they can keep the flexibility up there, that's a good step towards the classics. But ugh, if we have to watch every animation, every movement, every modification to the combat rounds because it's a "living world" we're watching, the game is going to get stale very quickly with impatience. Remember in the classics, we walk into a square already filled with 496 berserkers and begin the combat mechanic. They're all there already, there's no waiting for more to arrive. Within 5 seconds of committing to the fight you'd be launching off a MIBL zapping every one of the 496 enemies. Now again, that was possible because of the very very basic graphic and technical makeup of the BT engine (encounters were designed around the capability of the game engine). BT4 is beautiful, and has a lot more graphic capability - so again, I'm not against pretty graphics; I just don't want to see the graphic engine glorified at the expense of gameplay. I'm not going to expect a 496 creature quick encounter in BT4 (but would welcome it! :)), but that's the far extreme end of the scale from where we're sitting now, IMO. Ultimately, I'd still like to see some more combat encounters in the engine they've got, see what kind of flexbility to the the engine they're building in; toggles, optimizing. Just as we should be able to skip cutscenes if we've seen them or don't want to watch, will we be able to skip past lumbering character animations, especially in combat, or will we be forced to wait? That's part of the "literal" graphic mechanic I'm not a huge fan of, at least when it comes to BT. So that's four "groups" of enemies. A single target spell cast at B would hit one of the dragons. A group attack spell cast at D would hit all 52 Eye Gores. A spell that targets "ALL" would, obviously, hit every monster in every group. Also, your melee fighters would only be able to target the Curs because everyone else was further away. If the Dragons were at 10' as well, you could attack either the Curs or the Dragons. And while you wouldn't likely find this particular mix in BT3 (they're all from different dimensions), fights against this many enemies is totally par for the course. Which is part of why many of us are underwhelmed with the proposed combat in BT4 where it looks like we'll never face more than 8 or 12 enemies. Which is part of why many of us are underwhelmed with the proposed combat in BT4 where it looks like we'll never face more than 8 or 12 enemies. *And I do think that it's likely a case of preferred UI & game style not being able to handle it, where another style could have... but was not preferred. Specifically, in the fight, they engage in the 'living world' a single creature patrol - but that single creature was an abstract representation of a group of 3. I was thinking along the same lines a while back: a single visual creature could be a stand-in for multiple. I don't know if they'll do that. Maybe not, or maybe it could make a comeback for BT5, based on the BT4 engine, a year or two down the road. It could add some interesting tactical potential, I wager. I'm OK with giving up on the mechanic for BT4 (it is a little weird anyway - how do you fit 30 of some large-ish creatures in a 10 foot wide hallway, anyway?). Doesn't bother me much to lose it if in exchange we get interesting and deep tactical combat, but also wouldn't bother me if it came back. I have never liked unit stacks represented by a single unit. I got used to it in the recent King's Bounty games, but in those games, the world is entirely abstracted—almost like a war-room map, with little animated figures on it. Homes are the size of out-houses, and castles are the size of tennis courts... In BT4 the game world is not very abstracted; not by what they have shown us. Does anyone really want this in BT4? Realms of ArKania does come to mind as an alternative that I could get comfortable with. In the original game, exploration was not too removed from the Bard's Tale. Combat in RoA pulled back from the first person view, into a high isometric turn based combat grid. BT4 could do (have done) the same, and have used Dawn of War style squads of enemies. In Dawn of War, squads would attack as a group, and take damage as a group. Eventually they would die one by one as the group's hitpoints diminished. Indeed, I also would have preferred a less cinematic/visual approach, but larger scope. It could work on small/tiny opponents such as insect swarms, oozes, living weapons and so on. I have never liked unit stacks represented by a single unit. I got used to it in the recent King's Bounty games, but in those games, the world is entirely abstracted—almost like a war-room map, with little animated figures on it. Abstraction sometimes works wonderfully, but not in first-person "immersive" games, such as BT4. Heroes of Might&Magic up to 5 (and to a lesser degree King's Bounty) are nevertheless great games! Homes are the size of out-houses, and castles are the size of tennis courts... In BT4 the game world is not very abstracted; not by what they have shown us. I wonder how they will handle scale in BT4. Getting around Skara Brae could be a huge pain, with that slow "movement speed" that was shown in the "demo". Just imagine classic dungeons with the BT4 engine... Dargoth's Tower, The 3 Towers of Gelidia and Malefia of course. Of course, they have to reduce the size and complexity of dungeons, but make them more immersive and cinematic. No, but that interface is (slightly) better (more BT-like), than the one shown in the "demo". Realms of Arkania does come to mind as an alternative that I could get comfortable with. I'd also go for the old-school implementation of Fate: Gates of Dawn and Wizardry 7 and yeah RoA2 classic is great! Im with Gizmo on this and i fail to see the appeal on unit stacks. What exactly is the difference between 423 Goblins with 1 hp compared to 1 goblin with 423 hp? It remains an abstraction and tbh it sounds a little stupid to have a group of 6 fight a few hundred berserkers. The above examples arent that bad, but its still a unreadable mess. Last edited by Lord of Riva on January 20th, 2018, 7:32 am, edited 1 time in total. The above examples arent that bad, but its still a unreadable mess. It's quite readable to me, I see nothing wrong with those classic pixel-fonts. You can pretty much read what and how many you are facing. Wiz7 even shows in parentheses the number of active (eg. non-CC'd) opponents. Well, hopefully BT4 comes with a readable combat-log. i am talking about how easy it is to interpret whats going information wise not the readability of the font. Im sorry if i used a bad word for that. But i also do not doubt that people like you with experience in such systems have trouble understanding it. Still the pictures for example look extremely full thats what i was getting at, mixed with the first point it simply makes not sense for an abstraction (or the actual numbers ) to exist as you can easily get the exact same effect without it. Its not really that important to me though. well while i cant say that you are wrong, i can say that the general idea can be done with a lot less than 400 enemies. Well you put the numbers there :). My point was the difference between high HP on one creature vs low hp on many certainly does have a dramatic effect on combat strategy. How many enemies is entirely arbitrary and subjective to the point. In this case, we're examining the possibility of MANY more enemies than implied is possible with the current setup. So we've yet to see if the engine can support that sort of high creature encounter in some form. Well you put the numbers there . My point was the difference between high HP on one creature vs low hp on many certainly does have a dramatic effect on combat strategy. How many enemies is entirely arbitrary and subjective to the point. In this case, we're examining the possibility of MANY more enemies than implied is possible with the current setup. So we've yet to see if the engine can support that sort of high creature encounter in some form. And my point was that it would be possible with actual enemies not abstracted ones. 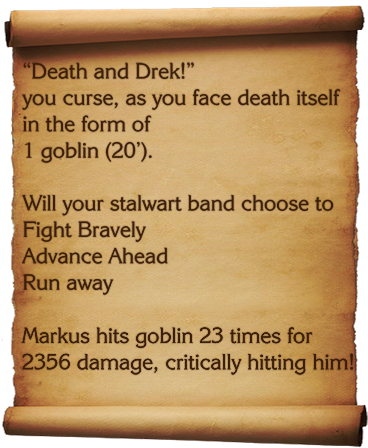 As you say the amount of enemies at this point is arbitrary.You could do what you propose with 2 , 3 or 400 Goblins but the fact remains that due to the abstraction the amount that cant be shown doesnt give any benefit and most likely will make it way harder to convey necessary information. As said, in the end its not a real issue, i can play HoMaM just fine, so i can probably manage bards tale with hundreds of abstract Monsters as well.